I posted previously about the best book I’ve read on being productive, Getting Things Done: The Art of Stress-Free Productivity by David Allen. Regardless of your work situation, this book can help you tremendously. When I get off track and feel overwhelmed by clutter and tasks, I grab it from my shelf. If you read my blog often, you are visualizing a dog-eared, well-worn book that may be missing a front cover. So why should you adhere to the practices in this book if I sway from its knowledge repeatedly? In Part 2 of this series next week, I’ll describe how to break down this diagram even further. Do you use any of these practices to master your workflow? 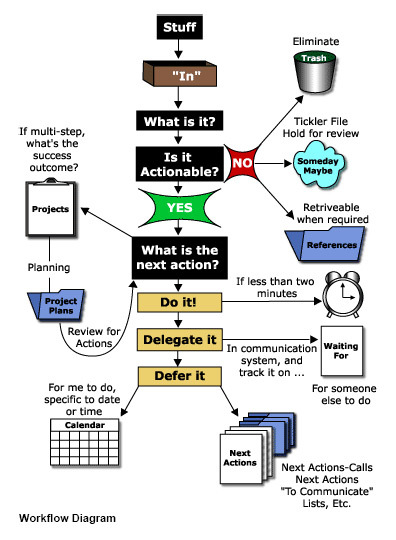 Are you doing it, delegating it, or deferring it? I appreciate that, Karen. I love sharing anything that's productive. Thanks Diane! I enjoyed it. Will do. I'll be implementing it on my large inbox today. This is great Kim, Thanks for linking it up!